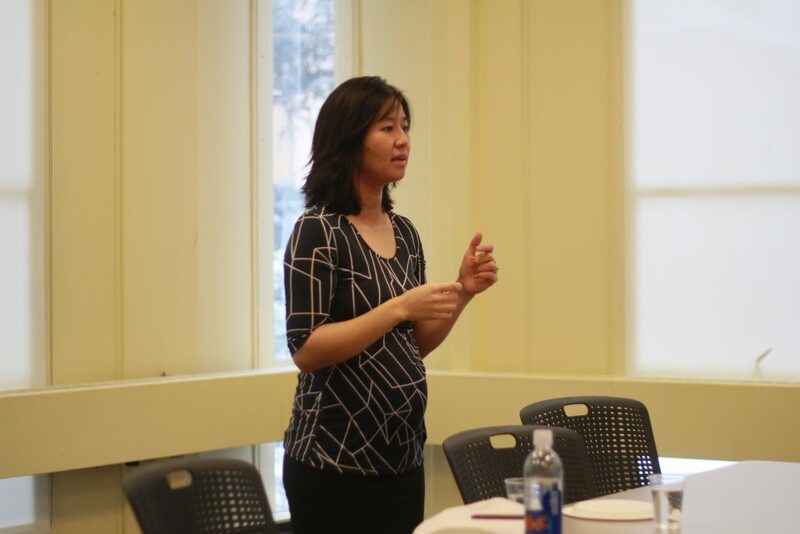 President of the Boston City Council Michelle Wu spoke at the Jonathan M. Tisch College of Civic Life yesterday afternoon as part of the Civic Life Lunches initiative. During the lunchtime talk, Wu spoke briefly about her family, education and rise in politics before taking questions from the audience. Wu is the first Asian-American woman to serve on the Boston City Council as well as its youngest current member. She worked in Boston City Hall under former Mayor Thomas Menino and was part of Senator Elizabeth Warren’s (D-MA) campaign for Senate. Despite this, Wu had no intention of serving in government when she was younger. As the daughter of Taiwanese immigrants, Wu said that stability was emphasized in her upbringing. Just out of college, Wu found herself handling multiple unexpected responsibilities. She was the primary caretaker for a mother suddenly struck with mental illness, the legal guardian for her two younger sisters and in charge of opening and running a family business to provide for her family. As a result, she had to find appropriate health care for her mother, a good education for her sisters and business permits and licenses for the business. Wu credited these experiences with sparking her interest in government. When it became apparent that her mother would need permanent, long-term care, Wu sold the business and brought her family to Boston, where she attended Harvard Law School and worked in Boston City Hall under Menino. She said that this work cemented her growing interest in politics. “[I] really saw that actually, from the inside of government, you can change things so that government is responsive, receptive and actually listens to people,” Wu said. By her third year in law school, Wu realized that government was a great place to make a difference, and an opportunity to bring change arose when Warren, a commercial and bankruptcy lawyer from Oklahoma and Wu’s professor, announced that she was running for U.S. Senate. Wu joined the Warren campaign with no political experience and started at the ground level, going from door to door and phonebanking. By the end, she had risen to the role of Constituency Director, reaching out to women, veterans, the LGBT community and communities of color, getting them to vote. When the Warren campaign came to a successful end in 2012, Wu announced her candidacy for Boston City Councillor At-Large in December and went on to win the 2013 election. In 2016, she was elected president of the Boston City Council. Throughout the talk, Wu stressed the importance of increasing participation in government and making way for the next generation of leaders. Wu praised several programs that aim to increase women or minority participation in government, including Emerge Massachusetts, which Wu graduated from in 2010. In a later interview with the Daily, Wu called for an increase in civic engagement among college students.